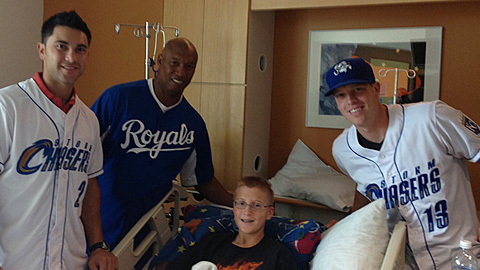 Anthony Seratelli and Buddy Baumann, the 2013 Johnny Rosenblatt Community Service Award winner, were two of the Storm Chasers players and staff members who donated their time to local groups in the Omaha Metro during the 2013 season. OMAHA, Neb. - A week after winning the Triple-A National Championship, the Omaha Storm Chasers are in the running for another important honor as the Pacific Coast League announced the Storm Chasers as their nominee for the inaugural John Henry Moss Community Service Award. The charitable arm of the team, the Home Run Foundation of Greater Omaha, donated $521,638 to local charities during the 2013 season, the most since becoming the Storm Chasers. The John Henry Moss Community Service Award is presented to a club that demonstrates an outstanding, ongoing commitment to charitable service, support and leadership within their local community and within the baseball industry. Each league in Minor League Baseball nominates a team and the overall winner will be announced at the annual Baseball Winter Meetings, taking place December 7-12 in Orlando, Florida. "The mark of a truly great organization is the commitment it shows to the community. The Storm Chasers strive to live up to that commitment every day, in-season or offseason," said Omaha Storm Chasers President and General Manager Martie Cordaro. "We are proud to represent the Pacific Coast League with this nomination. Winning the Triple-A National Championship was a tremendous honor, but winning the overall award would be equally meaningful." The Storm Chasers community involvement started well before the first game of the 2013 season, and the team actively went out in to the Omaha Metro and donated a total of 1,049 hours of their time to local groups. The Chasers front office assisted those in need through cooking/serving at Ronald McDonald House and participating in Salvation Army Bell Ringing at local Hy-Vee stores, while also supporting struggling families with "Drumsticks on Wheels" and "Project Wee Care" during the Holiday Season. Storm Chasers players and the mascots Stormy, Casey and Vortex made nearly 250 appearances combined throughout the 2013 season. The Home Run Foundation of Greater Omaha teamed with the Salvation Army and Boys & Girls Club of the Midlands to celebrate the fourth year of Chasers FUNdamentals, where Storm Chasers staff teach baseball to underprivileged youth for two hours every Monday and Wednesday over a five-week period. The Chasers grounds crew volunteered to upgrade a Hillside Little League field by rebuilding the pitcher's mound and refurbishing the fences and dugouts. On the field the Storm Chasers players scored donations through game-used jersey auctions, highlighted by "We Support Oklahoma" jerseys that raised more than $9,000 for the American Red Cross. Other jersey auctions included the Jackie Robinson "42" and "Omaha Force" jerseys, and all auctions combined raised nearly $20,000. Staples of Omaha Storm Chasers Baseball, "Canned Food Sunday" and the "Hurl the Pearl" contest, had strong 2013 campaigns. The Open Door Mission received 4,019 canned food donations ($28,133), the most since the move to Werner Park, while "Hurl the Pearl" accumulated $15,587 to be donated to the Ronald McDonald House marking a second straight year the team has raised more than $15,000 from the promotion. Werner Park was not only a site of Storm Chasers-driven community involvement, as many local organizations used the stadium as a venue to host large-scale fundraisers. 2013 special events included the "Boxer 500" benefitting the Great Plains Colon Cancer Task Force, "Light the Night" benefitting the Leukemia and Lymphoma Society and the "Walk to Defeat ALS" benefitting the ALS Association Keith Worthington Chapter.